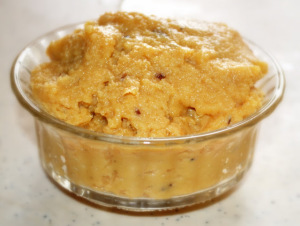 Khoa: Khoa or khoya is a dairy product widely used in Indian, Nepalese, Bengali and Pakistani cuisine, made of either dried whole milk or milk thickened by heating in an open iron pan. There are three types of khoa – batti, chickna, and daanedaar. Batti, meaning “rock,” has 50% moisture by weight and is the hardest of the three types; it can be grated like cheese. It can be aged for up to a year, during which it develops a unique aroma and a mouldy outer surface. Chickna (“slippery” or “squishy”) khoa has 80% moisture. For daanedaar, the milk is coagulated with an acid during the simmering; it has moderate moisture content. Different types of khoa are used for different preparations. The below recipe is for chickna khoa. Heat the milk in a heavy bottom non-stick pan on medium heat. Once the milk comes to a boil, let it simmer and reduce on medium-low flame. Keep stirring after every 3-4 minutes using wider spatula. Note: If you are using very normal spoon or spatula then you might miss some of the bottom surface and milk will stick and burn there. Keep stirring for 40 minutes or until the milk is reduced to 1/4th of its initial volume. Stir continuously with scrapping bottom of the pan and also sides of the pan. The milk proteins will start coagulating and the milk will be little grainy. Don’t leave the milk unattended and stir continuously till the milk resembles grainy paste. After this stage, you need to stir and scrap sides continuously. 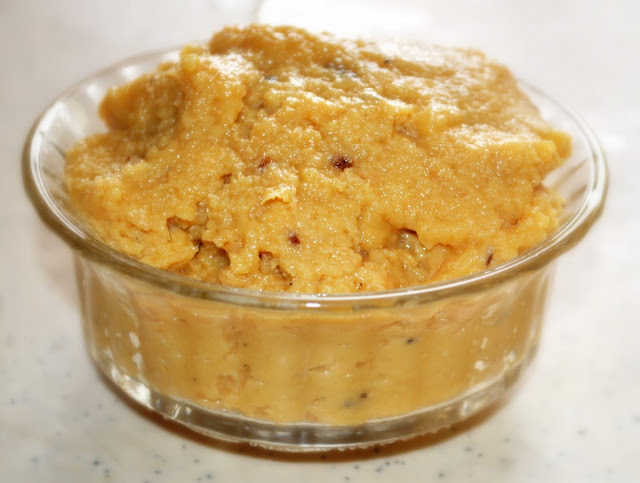 Keep stirring and keep cooking, till it becomes solid or dense like halwa. You will feel that it will take little effort for stirring. Remove the khoa off the stove heat. Transfer the khoa to another bowl and let it cool completely. As the khoa cools it will thicken and harden. Shelf life – once cools completely, it can be refrigerated up to 3-4 days. Or you can freeze it for a month. It is recommended to use non-stick heavy bottom pan and wide spatula. Cooking time may vary depend on the shape and size of the pan. It also depends on the how much quantity (half, double, triple) you are making. When it comes to making khoa/mawa, your presence and frequent stirring is the tip. If you forget about them, the khoya which has to be beautifully coloured in creamy yellow might turn brown and burnt leaving ugly smoky smell to your milk solids. If you have any queries regarding the Khoa recipe, please leave a comment.